← Large Flashing White Light Moves Slowly. 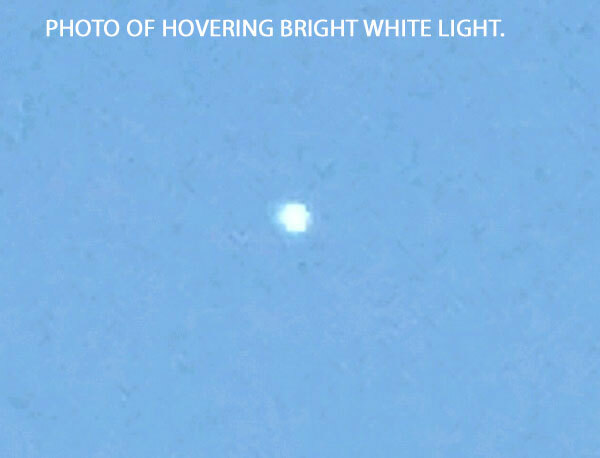 PHOTO OF BRIGHT WHITE HOVERING WHITE LIGHT. Description: A bright white light, larger than any planet or star, appeared against the blue evening sky before any other planets or stars were observed. A partial moon was observed to the West. The object was brighter than the moon. It was a windy day, clouds were moving, but the object was motionless, stationary for over 20 minutes, with no movement and no other lights. I checked about 1/2 an hour later, after dark and the object was gone. Note: No bright planets were visible at the time of the sighting. The object could have been a high altitude balloon, but as the witness pointed out it was quite windy and the object appeared stationary. It is also doubtful that the object could have been a weather balloon. This entry was posted in bright light, circular, Orb(s) of Light, Photos, Possible balloon, UFO Sightings 2019, UFO Sightings Arizona and tagged Hovering, White lights. Bookmark the permalink.